By Tuesday night, something incredible may have happened in European and World football. One European nation may well have taken a giant step towards becoming the smallest ever country to qualify for the World Cup by securing a place in the playoffs, meaning they would be just one two-legged tie away from making the World Cup. This team has scored more goals in qualifying than much stronger teams like Spain, France, Portugal, Serbia and Croatia and has managed to defy the odds in order to give themselves a real shot at making history. This team is Iceland. For those who don’t know, Iceland is an island nation found in the North Atlantic Ocean. It is famous for being extremely volcanic; you might remember a few years ago an ash cloud from a volcanic eruption stopped air travel in Europe for a few days; and is also very seismically active. Iceland has a population of around 325,000, and it is Europe’s most sparsely populated country. To put it into context, Iceland has a population one quarter of that of the current smallest nation ever to qualify for the World Cup, Trinidad and Tobago (1.3 million). Iceland currently lies in second place in its qualifying group, with the eight best runners-up from the nine qualifying groups moving on to a playoff. They play Norway away on Tuesday. On paper that doesn’t sound too easy but Norway are now out of contention for the qualifying spots. Group E is one of the tightest groups in UEFA’s qualifying competition for second place. Up until the penultimate matchday on Friday, no team had qualified and only Cyprus have so far had been eliminated. Switzerland’s 1-2 victory away to Albania on Friday night saw them top the group five points clear of second placed Iceland ith one game to play. Now that Switzerland have qualified, there are still two teams that can finish as runner-up in the group, but as it stands, only Iceland would have enough points when the results against the bottom-placed team are ignored (in UEFA there are 8 groups of 6 teams and one of 5 teams, so to make it fair the 8 best runner-up places are determined by results against the top 5 teams in each group), to count as one of the top 8 runners-up without having to rely on goal difference. This means the ball is very much in Iceland’s court. Whilst Iceland are playing Norway away, Slovenia travel to Switzerland. Although the Swiss have already secured top spot, they are on a 13 game unbeaten streak and will not relinquish it easily. If Iceland do manage to finish second in their group, it will cap a remarkable turnaround in fortunes for the Strakamir Okkar (which means ‘our boys’) in just a couple of years. Iceland have never qualified for a major football tournament before. Their previous best qualifying performance was in the qualifying competition for EURO 2004, where they went into the final game against Germany with a chance of topping the group, but lost 3-0. The most famous moment in Icelandic football might have been in a game against Estonia in 1996, where Arnor Gudjohnsen was substituted for his son Eidur (who later went on to play for Chelsea and Barcelona amongst other clubs). Following a dismal qualifying campaign for EURO 2012, where Iceland only picked up 4 points and lost 6 out of the 8 games they played, Iceland fired their manager, Olafur Johannesson. Iceland thought big when looking for a replacement, and ended up hiring Swedish manager Lars Lagerback. Lagerback had been manager of Sweden for 9 years (for 4 of those he was joint manager with Tommy Soderberg, having previously been Soderberg’s assistant), managing Sweden in the 2002 and 2006 World Cups, as well as EURO 2000, 2004 and 2008. Lagerback had also managed Nigeria in the 2010 World Cup. So, Iceland had hired a very experienced international manager. Despite the Icelandic league being weak (currently ranked 37 in Europe) and the small population size to work with; for the past couple of decades Iceland has seemed to produce a disproportionate amount of good footballers, but they weren’t producing enough to make a strong team. In 2000, the KSI (the governing body of football in Iceland) decided to overhaul the league system and infrastructure, with a heavy emphasis on improving the facilities available to young players. “The start of the radical change in Icelandic football we’ve seen over the past ten years was the building of the indoor facilities and stadiums we have now. It was a big effort but we can now see the benefits of it. As a result of an improvement in facilities, more people are now playing football, with an estimated 22,000 registered footballers in Iceland, which is about 7% of Iceland’s total population. This has been coupled with a sevenfold increase in the number of UEFA qualified coaches from what the number in 2000. Sigurdsson says, “The level of coaching in Iceland is at a very high standard now. Every club now has a team of well-educated coaches for each of their teams, at every age group. “Of course, it would be no good to have great football facilities if there weren’t qualified coaches to guide the young players (England take note). You need to get the mixture right, and it looks like we’re doing that. This policy has started to bear fruit, with Iceland’s Under-21 team qualifying for the 2011 UEFA Under-21 Championships, where they beat Germany to a qualifying spot in their group, including a 4-1 win over Germany. Currently, Iceland’s under-21’s are top of their qualifying group for the 2015 championships, with four wins out of four so far. Over the past four years, 17 players have graduated from the under-21 team to the senior side (which would’ve been 18 had Aron Johannsson, not opted to represent the USA having represented Iceland at every level except the national team), which is far more than most countries can manage. Apart from the obvious advantages of having an influx of fresh talent in the team, with several of those players now plying their trade in some of Europe’s stronger leagues; there’s also an advantage in having a large proportion of your team having played with each other from a young age, and that’s an advantage Iceland have used well. Iceland dreamt big when they appointed Lagerback as head coach. Despite having an experienced manager and an improved side, the odds were still stacked against Iceland qualifying. Their poor performances in EURO 2012 qualifying meant that their ranking was so low, they were in the bottom pot (UEFA teams are split into 6 groups of nine determined by ranking, with qualifying groups being made up of 1 team from each group) when it came to drawing the qualifying group, which meant that, in theory at least, Iceland would have had to face five teams that were stronger than them. 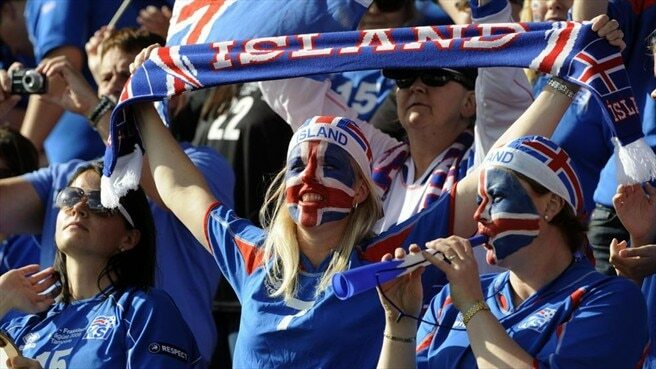 Iceland started their qualifying campaign with a great 2-0 win over Norway, but followed that up with defeat in Cyprus. There have been some disappointing results, including a 2-4 home loss to Slovenia, but as the other teams in the group have been taking points off each other, Iceland has been steadily winning. They showed that they were serious contenders in September by coming back from being 4-1 down in Switzerland to draw 4-4, which is even more remarkable when you consider that prior to that game; Switzerland had only conceded 1 goal in qualifying. Iceland then followed that up with a 2-1 win over Albania, which has put them in a great position to get to the playoffs. And with Friday’s 2-0 home victory over Cyprus, it has set the scene beautifully. Should they get there however, it won’t be easy. The playoffs are seeded, and amongst the current second place sides, Iceland are one of the lowest ranked, which could mean they play a team like Croatia, Greece, Portugal or Sweden. However Iceland’s 2014 World Cup story ends, the team can feel very proud of the massive step forward they have taken during this qualifying round, and, thanks to a tremendous amount of effort in developing a thriving youth system, have every reason to feel optimistic that they will be able to sustain this improved level of competitiveness in years to come. Brilliant article, it made even prouder of this achievement. Great article, althought not entierly correct that iceland has never qualified for a major turnament before, as the Icelandic womens soccer team qualified and played in the European championship 2013!! Women’s Euro 2013 had around the same average attendance as the 3rd highest league in England, so I don’t think many would consider it a major tournament. The playoffs are seeded by ranking. Fair Play? Iceland already had to battle higher ranking teams in the group because of seeding. Imagine if the World Cup final 16 would by seeded by ranking, and then the quarter and semi finals. Does that sound fair?